An apple a day certainly does not keep the doctor away, but one thing I've learned over the years is that reading graphic novels helps me cope when I'm down with the flu for a week or two. I don't exactly know why. Maybe it's because a graphic novel is a detailed story that can be absorbed in a single dose over an hour or two, and so it's easy on an exhausted mind and body. Or the combination of dialogue and images are less taxing than pure text where the brain has to create everything from scratch. But being sick doesn't stop me from reading regular novels though. Maybe it's as simple as graphic novels being comfort food for the imagination... kind of like chicken soup, except with full-page single panel explosions and characters engaged in scripted pose-offs. I tend to stockpile graphic novels for the sick times too. Sure, I read some when I first pick them up at the comic store, but others I'll shelve for the sick reserve so that I'll have something "new" to read when I'm stuck in the house for days on end. Illness is also a good time to re-read old favourites... with some exceptions: I found out the hard way about four years ago that it really, really isn't a good idea to re-read Arkham Asylum late at night in the midst of a crushing fever. Okay, to be fair, I read this one a couple of weeks before I got sick, but it was just so damn good, I couldn't leave it off of this review list. I mean, how could you not love a book where Darth Vader lays down a Force choke on Jabba the Hutt (in a nice father-daughter nod to the crime lord's ultimate fate in 'Jedi) within the first few pages? 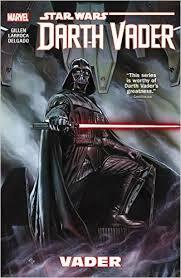 The art work is fantastic, the story in this volume is good, and Gillen does a great job of writing Vader true to how he was portrayed in the original trilogy: the choice of words and their delivery, the way he deals with others, and how he moves through the story is thoroughly authentic. I was initially cautious when I saw this comic series first appear on the shelves, but after this first collection of issues, I'm looking forward to the next Darth Vader graphic novel. 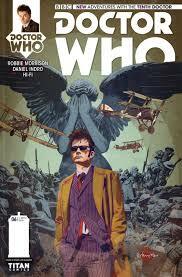 This graphic novel probably would have been more appropriate for Remembrance Day than Hallowe'en, but "Blink" was one of the scarier episodes of Doctor Who, and a story featuring the Weeping Angels stalking soldiers amidst the ruins of a French town during the horrors of the First World War is conceptually frightening enough to be worthy of October 31st. While the illustrations of our hero rarely come close to actually looking like David Tennant, the dialogue and depictions of movement are spot-on for the Tenth Doctor. The main story of the flight of the soldiers and the Doctor and his Companion, Gabby Gonzalez, from the Angels was suitably fast-paced, and the tension was enhanced by the gloomy colouring of the art and its unflinchingly adult portrayal of the brutality of war (such as the full-page spread where we see not only bodies strewn across the battlefield during a charge, but a man being shot through the neck while another is impaled and still another is burned — not details we'd see on the more kid-friendly TV instalments of the Doctor's adventures). But I also appreciated the side stories of the soldiers, not just trying to survive, but talking with each other about home, and later on, what happened to them when each was eventually confronted by the Angels — they were given the full treatment of primary characters, rather than being casually discarded as background props. By showing the soldiers' fates, the story gets added weight by reinforcing the danger of any meeting with an Angel, but more importantly, it makes these characters memorable — memorable in spite of the fact that they're not the Doctor or his Companion or generals who would be written about in history books — and in so doing, it reinforces the underlying idea that every soldier who went off to World War I (or who has served his or her country in any capacity) was a person with his or her own story who is worthy of being remembered. 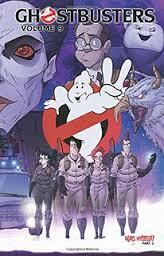 One of the things that's really impressed me about the Ghostbusters graphic novels over the past few years is how they've done such a great job of capturing the feel of the movies. While the drawings are not meant to be portraits of the various actors, they definitely capture the impression of them, an impression that's heightened by dialogue that's true to what the characters might have said, and how they would have said it, if they'd been written by Dan Ackroyd and Harold Ramis like the originals were. The series has also had strength in its storytelling, which isn't afraid to get dark, and the artwork, which is rich in detail and allusions not just to the two movies, but to other films that the various actors were part of (from Ray's guardian angel looking like Jake Blues, to more subtle fare like the Hulkaburger restaurants), and even deeper references to other things that might not have a direct connection to the films, but are entirely appropriate none-the-less (like a cut-out ad for Mikey, Donald and Goofy's "Ajax Ghost Exterminators" company from Disney's ancient Lonesome Ghosts feature). What I also appreciate is that the series keeps time and the development of the characters moving forward — the team accumulates new equipment and makes technological developments, they have new political realities to deal with, and they have to deal with personal experiences with lasting consequences. This latest two-parter maintains that standard of excellence. "Mass Hysteria" has the boys in grey bringing back some of their associate members like FBI Agent Melanie Ortiz and the guys from the Chicago franchise, while Ray's store employee, Kylie Griffin, and Janine also suit up to help out again. They're faced with another divine incursion into the Earthly plane: the Sumerian goddess Tiamat has been stirring up trouble — including hijacking Dana Barrett and Louis Tully for another round of possession and transformation — as a prelude to a grudge match with her sibling, Gozer the Destructor. 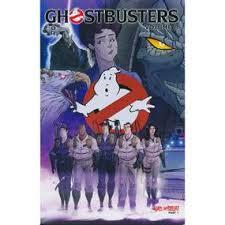 Amid the wisecracks and the blasting of spectral badguys, there are some genuine human moments, such as when Peter and Dana talk about dealing with each other in the wake of their failed relationship; or when we see the emotional impact of Oscar no longer being part of Peter's day-to-day life; or, in a major plot point towards the end of the story, when one of the Ghostbusters is forced to deal with the hard consequences of what he's had to do to save the world. Who needs to wait for the new Ghostbusters movie (or movies, if some of the rumours are to be believed) when you've got comics that are this good? It's always interesting to see what Alan Moore will do next to tap into pop culture sources both antiquated and modern to expand his League of Extraordinary Gentlemen mash-up universe, so you never need to twist my arm to go into the comic shop to buy the latest instalment. That said, some are stronger than others, and you need more to make a story worth while than just a grab-bag of obvious and obscure references set on a roller-coaster ride adventure. 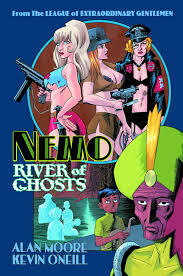 When it comes to River of Ghosts, the latest adventure of Captain Nemo's (now aging) daughter, Captain Janni Dakkar, the adventure moves along briskly enough, but there isn't enough attention paid to the personal angle of the story. It's 1975, and for Janni it isn't enough to be the ruler of a rich and powerful pirate nation, the head of an international syndicate of super villains, or a mother and grandmother — she has to ensure there's no unfinished business at the end of her life, and that every grudge is settled. That means that when rumours come to her of her old enemy Ayesha in league with Nazis in a secret base in South America, Janni is determined to go and personally settle old scores, regardless of any advice to the contrary from family, business associates, or the ghosts of old lovers, family, and friends who surround her, unseen by the rest of the world. Racing off with her crew — and stowaway grandson — in a new version of the Nautilus, she has to deal with dinosaurs and fembots on her quest for blood. As much as I enjoyed the references to Sir Arthur Conan Doyle's Lost World, and The Creature from the Black Lagoon, and Dr. Goldfoot and the Bikini Machine, as well as the secret Nazi base that would fit right in with any Hellboy adventure, the story didn't spend as much time as it should have with Janni actually coming to terms with the end of her life. Sure, there are the occasional bits with the ghosts, and the pacing of the story, along with some of the dialogue, is meant to show that Janni isn't allowing herself to think about anything else as she focusses on the mission, but really, I think a couple of added quiet moments of solitude when she couldn't escape the weight of her life would have given the story enough depth to be on par with Century 1910. There might have been room for that extra character development for Janni if Moore hadn't included the sub-plot about her grandson, Jack, and yet he needed to be part of the story to create the legacy for the next instalment as the universe continues to move forward. That said, I don't see why, as readers, we can't have our cake and eat it too, and have Moore allocate more page space to flushing-out Janni's experience, and introduce us to young Jack. I don't regret buying River of Ghosts, but it certainly isn't as memorable as some of the other League stories. Over the past couple of years, I've been slowly working my way through the back issues of the Hellboy graphic novel collections, and enjoying the process immensely. Conqueror Worm is no exception. 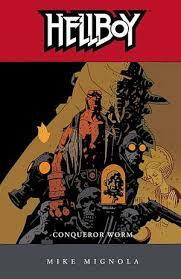 The story sends Hellboy and Roger the homunculus to a castle in Austria where, decades earlier, head-in-a-jar Herman Von Klempt sent a dead Nazi scientist into space to bring back some Lovecraftian Old Ones to destroy the world. Now Von Klempt and his cronies are back, awaiting the return of the capsule and its horrific cargo. The ghost of Rasputin, along with the spirit of old-time hero Lobster Johnson, also wade into the fray, along with other homunculi and an evil upgraded gorilla. Carnage ensues and the world is saved, thanks to the very human efforts of Roger, in spite of the BPRD's inhumane view and treatment of him. Conqueror Worm has everything that makes a Hellboy instalment great: rip-roaring action, brooding art, monsters both human and supernatural, and at its heart, a story about Hellboy facing the challenge of doing the right thing and what it means to be good. 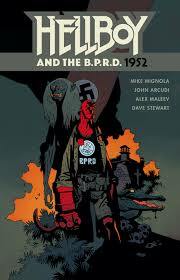 Even though I'm not finished going through the Hellboy back issues yet, I saw the new '1952 graphic novel on the comic store shelf a while ago and decided to pick it up anyway, just to see how Mignola and his crew would do winding the clock back to Hellboy's early days in the supernatural superheroing business. While the art and subject matter are both worthy of the franchise, I can't say the same for the story. I didn't hate it, but for all its length, it felt rushed, and ultimately came off as flat. When a series goes on for as long as Hellboy's has, it's inevitable that it's going to stumble at some point, and I guess this is it. Hopefully the next volume will get the series back in the race.